For the month of June 2013, Strolling of the Heifers' annual Farm Art exhibits are on view at four different Brattleboro locations. "Farm Art" is work inspired by and celebrating land, farmers, farm animals, local wildlife, and the natural world in Southern Vermont. 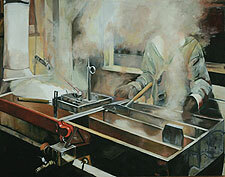 All work is for sale, with a portion of the proceeds going to Strolling of the Heifers to support its programs. 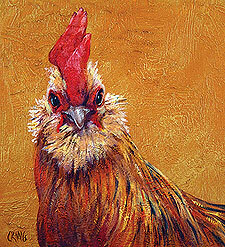 Contact Caryn King at (802) 380-7006 for questions about all the Farm Art exhibits and to purchase paintings. Featured in June is the exhibit "Plowing Old Ground: Vermont's Organic Farming Pioneers," with photographs by John Nopper and text by Susan Harlow. The stories told in this show are of Vermont's early organic farmers, who built an industry and a culture from scratch. Many of these farmers, now in their sixties, are asking themselves, "What will happen to my farm?" They are getting ready to retire, but few of their children want to farm the land themselves. Theirs are important stories that we don't want to lose. Six working farms and their farmers are highlighted, including Jack and Anne Lazor of Butterworks Farm in Westfield; Paul Harlow of Harlow Farm, Westminster; Jake and Liz Guest of Killdeer Farm, Norwich; Joey Klein of Littlewood Farm in Plainfield; Bruce Kaufman of Riverside Farm, Hardwick; and Vermont's first officially certified organic farmer, Howard Prussack of High Meadows Farm in Putney. Images and comments by writer and organic farming advocate Samuel Kaymen will also be included. Susan J. Harlow is a long-time agricultural writer, magazine editor, and author of a recent history on the University of Vermont Extension System. She works at Antioch University New England and lives in Westminster, Vermont, on Harlow Farm, where she grew up. Paul Harlow is her brother. 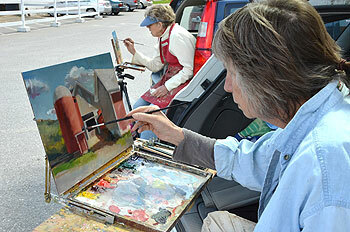 "Plein air" painting means painting out in the open -- in this case, on the farm. A juried exhibit organized by local artist Deborah Lazar assembles works painted at Brattleboro-area farms during the months of April and May. Artists include Deborah Lazar, Caryn King, Nancy Calicchio, Mary Iselin, Marjorie Sayer, Karen Becker, Heidi Lorenz, Linn Bower, and Georgie. 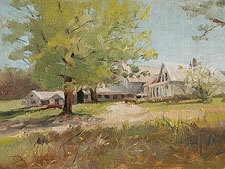 They painted at the Retreat Farm in Brattleboro, Lilac Ridge Farm and Robb Family Farm in West Brattleboro, and the Franklin Farm in Guilford. During June, The Marina restaurant is hosting an exhibit by local artists Georgie, Janet Picard, Deborah Lazar, and Caryn King. Stop by during Gallery Walk from 5 to 6:30 for complimentary snacks, or for lunch, dinner, or Sunday brunch at some other time. If you haven't visited the post-fire rebuild yet, you'll be wowed by the indoor and outdoor spaces! Artist Caryn King curated the Farm Art show gracing the halls of Brattleboro Memorial Hospital, which will remain on view through the summer. All of these works are offered for sale, with a portion of the proceeds to benefit Strolling of the Heifers. Artists include Georgie, Caryn King, Esther Fielding, Lesley Heathcote, Deborah Lazar, Nancy Calicchio, Lynn Hoeft, Paul Madalinski, Nancie McLean, Meris Morrison, Janet Picard, David Rohn, Marjorie Sayer, and Robin Truelove Stronk. All live and work in the Brattleboro area. NOTE: "Faces of the Farm," an exhibit at River Gallery School, 32 Main St., includes paintings, drawings, prints, sculpture, and other works depicting farmers and animals at Lilac Ridge, Harlow Farm, Franklin Farm, Taylor Farm, Dwight Miller & Son Orchards, Green Mountain Orchard, Vermont Shepherd, Panic Swamp Farm, Sheep's Nose Farm, and Paul Boyd Farm -- http://rivergalleryschool.org for info.